... Rigol compared it to their own devices and with the device specifications, this noise is considered normal and within specs for the MSO1000Z series devices. Unfortunately we can't improve it any more. My question is does anybody experienced the same behavior on not completely new MSO or any other RIGOL's device from the same series/class? Thanks in advance. Looks pretty much identical to mine in the scenarios given. 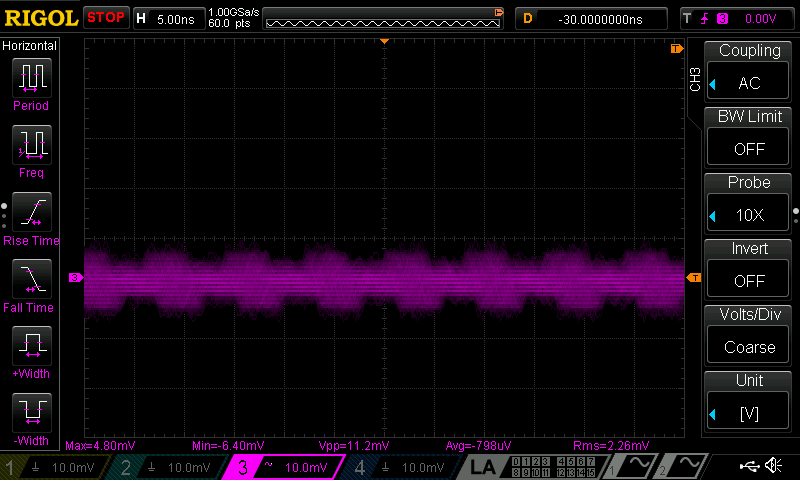 You are operating at 10mV/div on 10X, you're seeing the ADC noise on the LSBs. Thanks, I noticed that today. For some reason I was convinced that it was much better some times ago. Unfortunately I have no screenshots from that time and obviously self-calibration is all what could be done to improve "reference" state. Next time (if it comes) I'll go fishing for some bigger name. So it seems that the new practice would be to starts a day with self-calibration. Are you sure that you didn't move ANYTHING in your lab? I experencied much noise from switching lamps and wall power adapters; that noise change even moving a hand or a metal can in the surrounding. Your probes probably act as antenna and catch all kinds of interference from the environment. Your test only makes sense with probes disconnected at least. Even better yet, connect a 50 ohm terminator to the scope input instead. Only then you'll get a consistent picture regarding analog frontend noise. I've got a desk lamp on my bench that even with it powered off when I move my hand near it I can see changes on my oscilloscope. Same thing with the ceiling light/fan 5-6 feet away from the scope (though on the same circuit), hanging in the middle of the room. That's pretty bad. 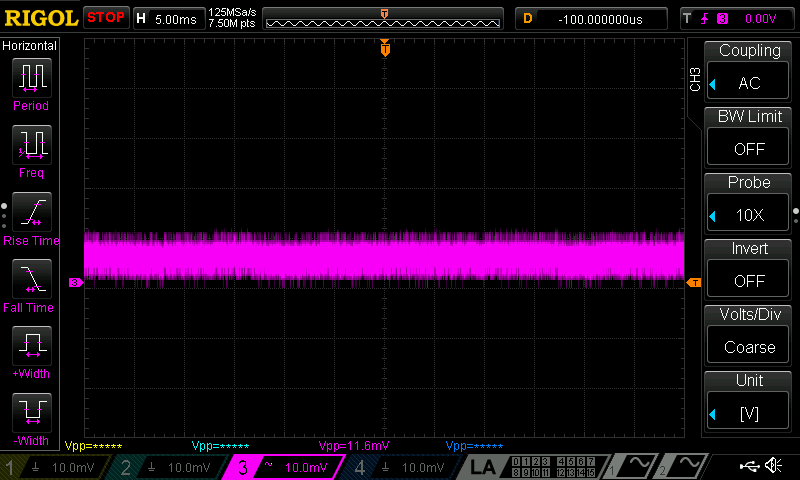 The noise on my Tek 465B's on 5mV/div isn't visible at all on a shorted 1m long probe. Dead sharp trace. Well, the posts above show the signal at 1mV/div. And I'm not sure whether the poster had shorted either the probe or the scope input; I think this was mostly measured with open input jacks? 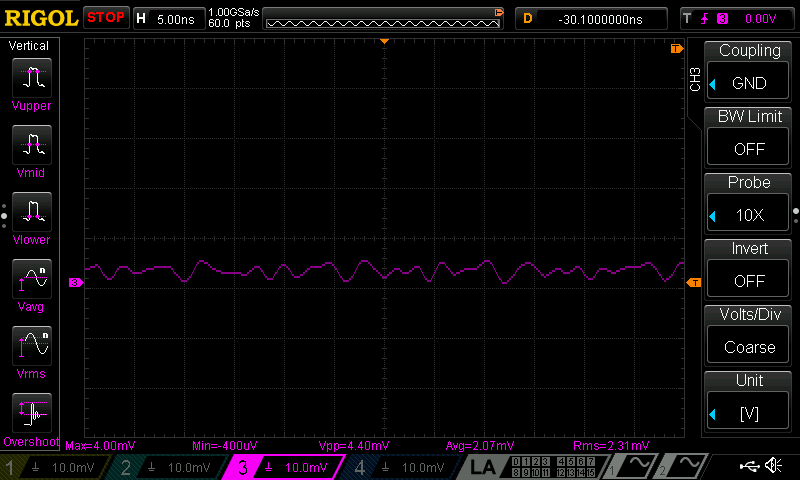 As mentioned before in this thread, measuring with a 50 Ohm termination right at the input is recommended if you want to make sure that there is no environmental noise coming in, and want to assess purely the noise of the scope's input stage. ebastler: Gotcha - didn't see the 1mV one. Not terrible then. Attached is a noise screenshot of DS6104, tested by RigolNA tech support. Looks very like when your scope is okay. When your scope looks noisy, it should be some noise picking up. Do a quick EMI measurement if you have a known calibrated high frequency (>500MHz) scope or a spectrum analyzer, using the same probe you use everyday. If you can not spot any radiation source, try turn off everything in you lab and see if the problem shows again or not. The last resort: ship it to Rigol and let them do their job. 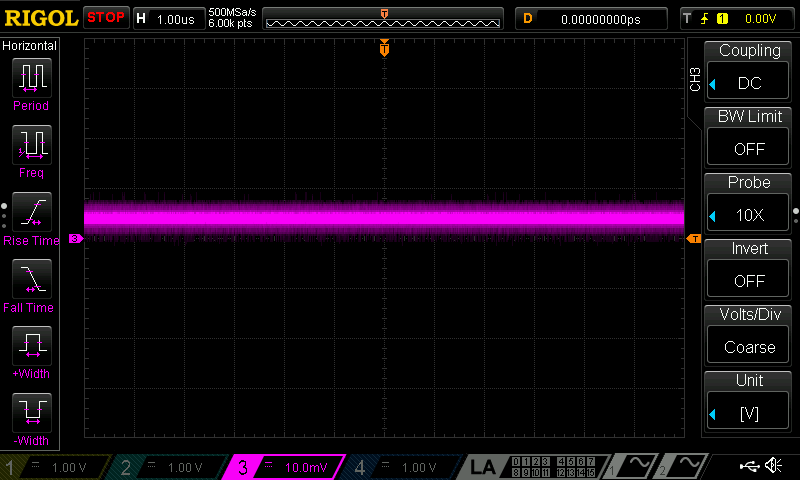 I was referring to probe plugged into scope with probe end not connected to anything (full on antenna mode). I was just mentioning because its not necessary for other electrical equipment to be turned on for it to be emitting noise that can be picked up. Dave did a video about why you would not see this on a analog scope. 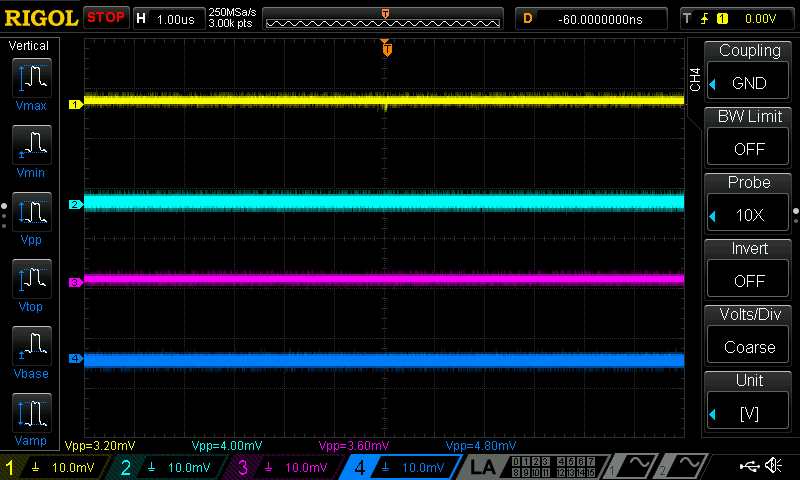 the 465B is a analog scope so not seeing on that scope is not a surprise. Thanks, I noticed that today. For some reason I was convinced that it was much better some times ago. Have you got any new lamps in that time? A new PC? Rigol are correct though. 0.5mV of noise isn't anything to worry about (on a budget scope). Thanks everyone for your inputs. Dave's video helps a lot. So far I can concluded that scope is working as expected. Only that remains to some extent strange is how self-calibration each time "improve" something. 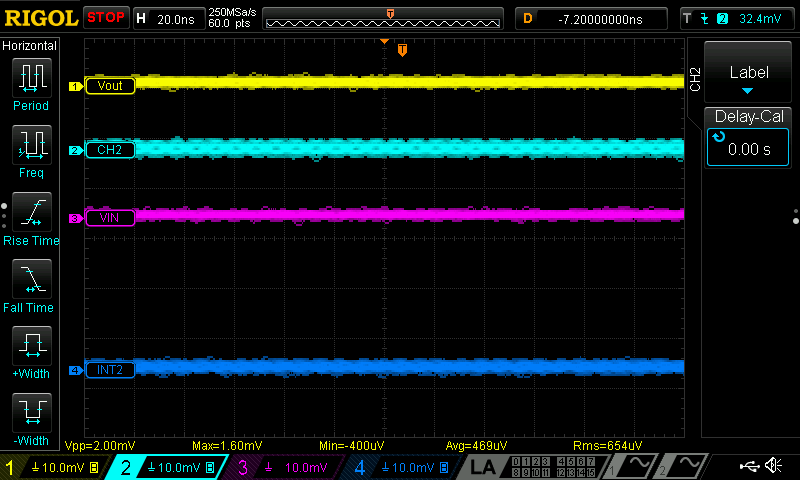 Same thing with my DS1054Z, it seems like its picking up some periodic noise signal on all 4 channels when it on the 1mv/div range (some channels are worst than the other).